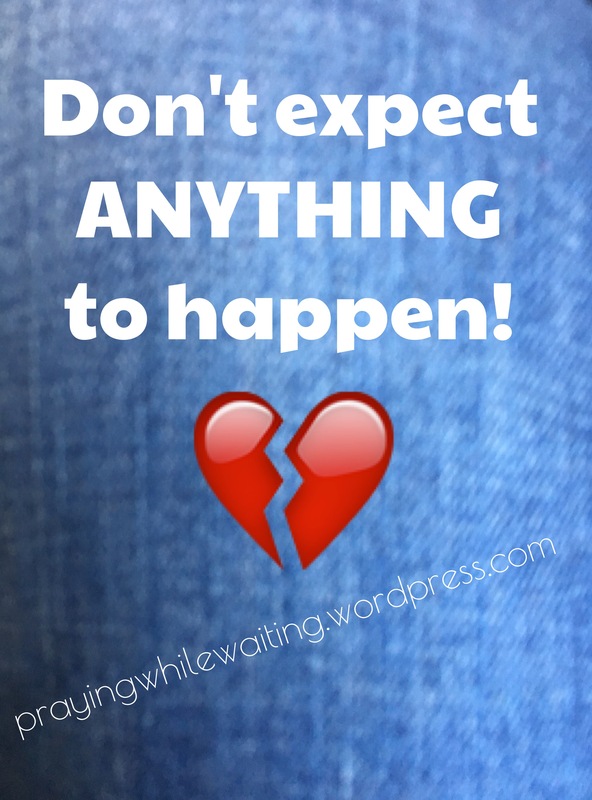 Don’t expect ANYTHING to happen! DONT EXPECT ANYTHING FROM A HUMAN BEING! When we have a crush and even when we are dating someone… We (women) have the tendency to EXPECT way too much from the poor dude. It’s happens to me when I have a crush, I STUPIDLY expect stuff from the dude. And by stuff I mean… I don’t know… Hmm… Him wanting to do things with you, go places with you, his protection, encouragement, guidance… Gosh even for him AGAPE love you! I know I know!!! That’s their role!! I get it! Sometime we expect what we give… But we forget that sometimes THEY DON’T WANT WHAT WE GIVE… Get it? Or can you really expect that from the guy you just started dating… Now if you are dating the guy and he is not showing you any of those things you that “expect” from your future husband… RUN!!! But if you are in the crushing stage and well he is just being himself… yet you are expecting those stupid expectations, YOU CANNOT GET MAD AT HIM!!! You cannot come to your girlfriends and vent because you expected stuff from him… That well let’s face it… Maybe HE DOESN’T WANNA GIVE YOU! Remember that these posts are for my single ladies so married women, this might not FULLY apply to you! Here is what I want you to take away from this post! Don’t expect much from a human being… It is not fair. It is not realistic! YOU CAN EXPECT EVERYTHING FROM YOUR HEAVENLY FATHER!!! You can expect so much from HIM that you can even expect that He would die and rise again from death FOR YOU! HE ALREADY DID IT!!! It was done! You can expect from Him to understand why you cry without saying a single word… A human cannot do that! You can expect from Him to know what are your deepest and DETAILED desires without saying a single word… A human cannot do that! You can expect from Him to surprise you with what your heart needs without saying a single word… A human cannot do that! STOP PUTTING EXPECTATIONS ON HUMANS!!!! IT IS ONLY GONNA HURT YOU!!! But put expectations on your Father… The King of kings… The Lord of Lords… THE CREATOR OF THE UNIVERSE… He can do anything!!!! PS. Sometimes it is GREAT not expect anything… It is then you don’t get hurt! Next Does he like me? !